Home Industry Updates DRINKS & BEVERAGES Sacmi Closures & Beverage to play leading role in Johannesburg. FDT Africa 2018, the biannual event dedicated to food & drink technology to be held from 4 to 6 September in Johannesburg, will see Sacmi play a leading role with a complete range of solutions for the closures and beverage industries. The Group has many years’ experience in the country through its Sacmi South Africa branch, which provides sales support and assistance. We see participation in this fair as nothing less than strategic: our focus will be on the latest technology for the industry, from our world-leading compression technology to complete, integrated pellet-to-pallet PET processing solutions. Taking centre-stage on the Group stand (a 30 m2 exhibition area, booth n° 145) will be Sacmi’s cap and preform manufacturing machines which – via the automatic CPB Link magazine – integrate downstream with complete blowing, filling and container labelling solutions. This is the new Sacmi HeroLINE, which provides greater logistic efficiency, reduces consumption and optimises production performance. 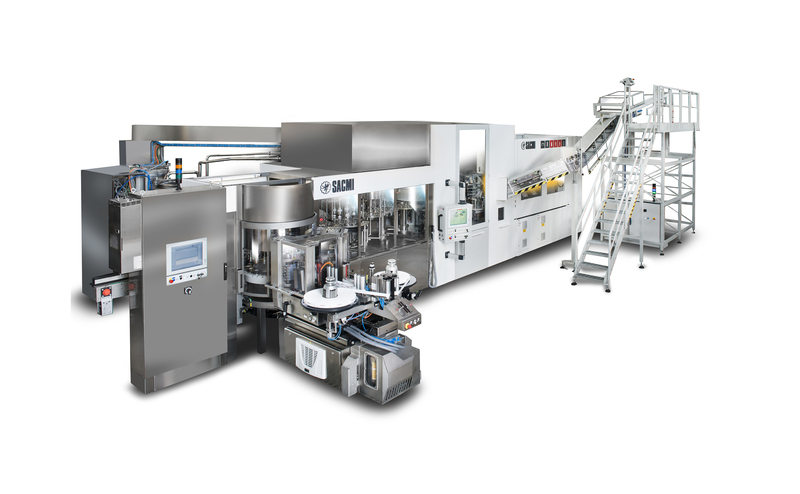 Also available in the new HeroBlock configuration (the compact, high performance all-in-one quadblock that combines the blowing, filling, capping and bottle labelling stages), this solution represents the very best from Sacmi, the world’s only competitor capable of providing solutions for every stage of beverage production. Capable of leading the way in numerous fields and industries, Sacmi has also succeeded in transferring all the advantages of compression technology to container production. A key example is CBF (compression blow forming), an innovative solution that lets manufacturers produce lighter, better-performing containers of higher quality at lower cost. This cutting-edge solution combines the very best characteristics of alternative technologies and is gaining ground on all the world’s key markets, especially in the dairy and pharma sectors. Lastly, inspection and quality control systems continue to play a crucial role. Based on a shared software platform developed by the Group’s Automation & Inspection Systems Division, these systems are configured to give customers total quality control at every stage of production. They also allow for implementation of advanced remote control functions via any corporate network-connected device. Last but not least, the Sacmi Group has also been winning over the dynamic African market (which, according to 2017 data, was again particularly appreciative of Sacmi’s complete PET processing lines) thanks to far-reaching assistance and outstanding service, which ranges from initial design to after-market solutions.